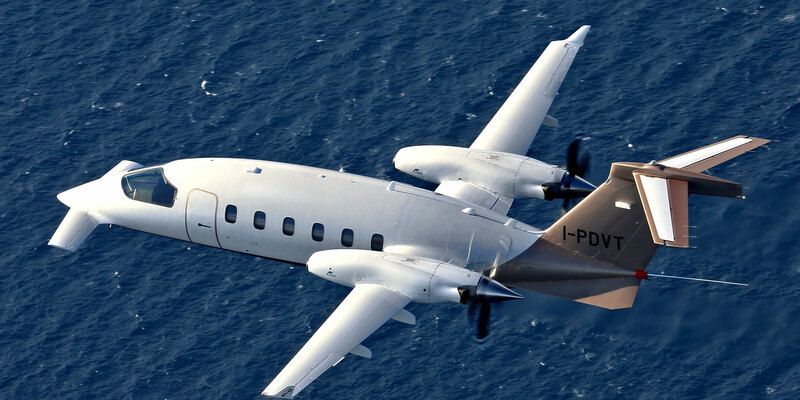 The P.180 Avanti Evo has a “wow” factor that is not present with many other twin turboprops of a similar size. Yes, it does have three lifting surfaces, a T-tail and two pusher propellers but it’s how they are put together that is the important thing. The forward wing (not to be called a canard, as it has no moving flight controls other than forward flaps) is positioned on the underside of a gracefully sweeping nose and is home to two pitot tubes underneath and, unusually in Western types, has a significant anhedral. The windshield is deep and sharply raked back, which along with the ventral delta fins, perhaps alludes to the shared Learjet origin from the 1980s. The upper fuselage curves to a peak height just in front of and above the main wing leading edge and then slopes downwards to join the lower fuselage upward curve at a point below the trailing edge of the T-tail that stands with its sharply swept back horizontal tailplane some 13.06 feet above the ramp. My attempt to follow Villi’s lead to my right seat was not so graceful. Because there is no overhead panel, I had sufficient head room to allow me to clumsily maneuver myself into position. Once there, I found the cockpit comfortable. The seat is raised or lowered with a lever outboard to provide a view that should just about look down onto the top of the glareshield. Because of the rake angle of the windshield, the glareshield is very deep and provides a perspective unique to the Avanti. No nose was visible ahead, but down and to the right from my seat I could see the tip of the forward wing and the shapely winglet was at my four o’clock. The front office of the Avanti Evo is the Rockwell Collins Pro Line 21.
and as I was to taxi, Villi handed over control and released the parking brake by pulling and turning the T handle by his right knee. Taxi steering was selected on the column switch, and the airplane moved easily at our ramp weight of 10,800 pounds. Using the rudder pedal steering in taxi mode, the feeling is very direct. The closeness to the ground gives the airplane a “go-cart” feel. By this I mean the Evo turns through the same number of degrees as your feet move on the pedals until you put in a sustained input when the full nosewheel deflection of 50 degrees is felt and the turning circle feels extremely nimble and asymmetric braking is not needed. Deviating from ICAO-compliant English, the controller told us, “Piste libre” before we lined up and discussed the departure. Villanova requires a specific qualification as it sits in a bowl surrounded by mountains with an MSA of 11,200 feet to the west, so Villi briefed he would fly the departure from Runway 9 and demonstrate a performance takeoff. Taking back control as we lined up, Villi held the brakes using the top of the toe pedals, advanced the power levers to 97.6 percent, and we accelerated briskly to 120 knots. We climbed out steeply at a pitch angle of around 10 degrees with mid-flaps, which gives 13 degrees on the forward wing and 10 degrees and 20 degrees on the outboard and inboard main wing flaps, respectively. These were retracted as we accelerated toward 160 knots. The “caution terrain” aural warning was sounding continuously as Villi maneuvered us to the left in visual conditions to fly around the hill, inconveniently placed on the extended certerline of the runway. At 160 knots, he handed control over to me, and we climbed at 2,500 fpm. We were cleared through 8,000 feet very quickly and then up to FL350, set up using the flight guidance panel (FGP) on the glareshield and appearing in cyan in the top right hand side of the PFD. Any altimeter setting mismatch is shown by a yellow line beneath the altimeter setting on the PFD, and the pressurized cabin is set to “climb” at 300 fpm. Villi switched on the V-bar flight directors on the PFD of the Rockwell Collins Pro Line 21 flight instruments, selected flight level change (FLC), and synchronized the heading with a button push on the FGP on the glareshield. I turned due south and climbed toward the military training area. Shortly before departure, Villi advised me that the autopilot function of the APS-300 flight guidance system was not available. Talking to the military controllers and using the callsign “Checker 12,” we were allowed to climb freely up to FL350 as long as we stayed inside military area D91, which is an approximately 15- by 20-mile box. Frequent heading changes are required to stay in the area and this allowed me to quickly get a feel for the Avanti. My last four years have been spent flying equipment with fly-by-wire controls and the Avanti’s flying controls are conventionally connected via cables, pulleys, push pull rods, and bell cranks. So it was no surprise that my first impressions were of relatively high control forces with noticeable system friction in both pitch and roll with, at low speed, a low geared pitch trim. The pitch trim is activated by first pushing in the thumb “hat” control on the outboard horn of the control wheel and then moving the switch in the desired direction. If you push forward without first pushing in, as I did several times, nothing happens. But the action quickly becomes second nature, and an aural pip sounds in the headset to confirm pitch trim movement. The power levers were manually adjusted as we climbed to maintain 100 percent torque, shown on the engine indicating system on the top of the central multifunction display (MFD) in green. The instrument is a dual-purpose gauge showing both torque and interstage turbine temperature (ITT), Tq shown by a green arrow and ITT by a line. Above FL200, the torque is allowed to reduce as ITT becomes the governing factor and we targeted approximately 800 deg C. The maximum continuous ITT is 820 degrees, but 785 degrees is recommended to produce rated horsepower in ISA conditions and improve engine life. As we climbed, the Vmo of 260 knots was displayed at the top of the speed tape on the PFD and the climb speed was maintained at 160 knots, reducing by one knot for every 1,000 feet above FL300. We leveled off at FL350 19 minutes after takeoff, I left the torque at 75 percent, and allowed the Avanti to accelerate to Mach 0.64 with an indicated airspeed of 216 knots and a TAS of 373 knots. While I flew, Villi checked the Airplane Flight Manual and the performance graphs corroborated these figures to within a couple of knots at ISA +5. To remain inside the military area, Villi encouraged me to roll on 45 degrees of bank. At FL350, the speed remained stable even with back pressure applied to maintain altitude, and the aircraft was easy to control. Slightly heavy control forces in roll assisted me in flying this accurately. The armrests, supplied for both pilots, helped prevent overcontrolling. Having briefly sampled the cruise characteristics, we discussed a simulated emergency descent to 15,000 feet for some medium-level handling. Closing the power levers to idle sounds the gear warning horn, which is canceled using a button on the RH power lever. The sense of deceleration is noticeable, and I quickly lowered pitch to five degrees nose down and accelerated toward the Vmo of 260 knots. This produced a rate of descent of just over 4,000 fpm, the maximum, as there are no flight spoilers and the gear limit is 180 knots. Had this been a real emergency, flight deck oxygen masks are stowed outboard of each pilot seat, readily accessible. Passenger oxygen deploys at 13,000 feet. During the descent, we briefed for some stalls, the handling qualities of which Villi was obviously keen to show me. The forward wings are designed to stall first to assist in lowering the nose at the stall, and the ventral fins also add pitch down moment. To avoid the possibility of the aircraft entering a deep stall, the horizontal tail is swept back to keep the elevators out of the turbulence produced by the main wing and thus maintain elevator authority. To demonstrate the first stall, Villi leveled at 15,000 feet, and with the power levers remaining closed, we decelerated at 1.5 knots per second as shown by the purple trend vector on the PFD airspeed strip. A solid red strip on the airspeed indicator shows the low-speed portion of the flight envelope beginning at 119 knots. As we approached this, Lorenzo increased the back pressure and stopped trimming at 1.5 times the stall speed. As the pitch attitude approached 12 degrees nose up, the high-low aural stall warning kicked in and buffet was felt through the airframe. This buffet, although it feels like a stick shaker through the column, is all aerodynamic from the forward wing and serves as an excellent stall warning. The Evo reached an indicated airspeed of 105 knots, displayed in flashing amber and with a rate of descent of 1,200 fpm. But as soon as Lorenzo released the back pressure and added power, the aircraft recovered and we were flying at 140 knots. To demonstrate the low-speed aileron control, Lorenzo then pulled back to the buffet and effortlessly rolled on 80 degrees of bank and then recovered to level flight. I followed Lorenzo’s example, if anything being a bit more aggressive with the speed decay. With the stick fully back, we reached 100 knots indicated but once again, as I released the back pressure and smoothly applied power, we recovered. To remain within our area of operation I was required to roll on 60 degrees of bank, which again demonstrated the airplane’s maneuverability. Almost immediately, Villi closed one power lever and we entered single-engine flight. The wings are held level easily with aileron and a squeeze of rudder. Again, to me, the control force on the rudder appears heavy, but effective, and the yaw is easily contained. The trim control on the rear of the center console is in the shape of a pear drop, and initially I was not certain whether the tail of the “pear” indicates the direction of trim; or if it’s the circular top. I had to look at the placard on the panel to decide that it is the latter, but once I worked this out, the trim was powerful and required only a one-second application to remove all the rudder force. pilot operation, so when a small amount of fogging briefly appeared on my (right) screen, the clear pattern would allow the left-seat pilot adequate visibility. The cabin provides a comfortable and quiet ride for passengers. Villi and I then headed to Genoa for some instrument approaches. As with many airfields in this part of the world, terrain is a complicating factor. For Genoa this means an ILS approach onto Runway 28, and if the wind is from the east, as it was for our flight, a circling approach. Villi took control from me to give me a rest. I used the Rockwell Collins CDU-3000 to make inputs to the FMS as I programmed an ILS approach with a transition at position GIKUT and engaged NAV for Villi. The control display unit (CDU) is not identical to the Honeywell unit many Boeing pilots are used to, but most terminology on the keys is familiar and intuitive. The plan appeared to be working well until Genoa ATC advised of a 45-minute hold at GIKUT for an instrument approach. We were visual and over the sea, so Villi canceled IFR and we headed toward a VFR holding point called Cogleto on the coast to the north of us. He descended to 1,000 feet to position for a visual arrival to Runway 10 with a touch-and-go. Villi selected the Rockwell Collins RTA-800 weather radar on his nav display via the display control panel down the side of the PFD, to monitor a cell just inland. I selected terrain on my PFD to map the coastline. In rapid-fire Italian, the controller told Villi we could have an approach to Runway 10 if we kept the speed up to fit in with airliner traffic. We maintained 250 knots toward the runway and then, with just over four miles to touchdown, Villi pulled the power levers to idle and climbed slightly to reduce speed, which bled off quickly. First, the gear came down below 180 knots, then mid- and finally full-stage flaps and we were nicely stabilized at 500 feet. In a jet this would have resulted in a go-around from 10 miles out. At 400 feet, Lorenzo handed me control for my first landing. I had a few seconds to get the feel of the Evo in the landing configuration before I was flaring for touchdown and gradually closing the power levers. The flare required is very small, just enough to cushion the touchdown, so the nose drops very quickly to the runway. No sooner had we done this, when Villi took control, performed an airshow-style liftoff, and turned to clear the runway for the next aircraft. We took up a westerly heading for our return to Villanova. Using the intuitive FMS CDU, I programmed a route toward BERAB, the initial approach fix for the VOR approach to Runway 27 at Villanova. As we tracked toward this point, Lorenzo handed me back control for the last approach. Piaggio’s home airfield is surrounded by terrain, and the approach is offset from the inbound course. So we planned to visually line up with the runway on short final. Discretion being the better part of valor, I extended the gear early and reduced speed to deploy the flaps, intending to stabilize nice and early so I could concentrate on flying as accurately as possible. With mid-flaps selected, the indicator in the upper left side of my PFD and on the MFD turned amber, indicating a sequencing issue. Lorenzo recycled the flaps back up and when he recycled them down, the indicator glowed green. As the flaps travel, there is a nose up pitch that is easily counteracted with slight forward pressure on the column and trim. We continued to decelerate and shortly after selecting landing flaps, I turned toward the hillside on my left to line up with the runway as we passed through 600 feet. The airplane is nicely stable on final. I managed the deceleration to approach speed with very small movements of the power levers and maintained final approach speed quite easily. Initially I erred on the side of caution and flew a few knots above approach speed, but as the runway is 1,500 meters (nearly 5,000 feet), and this was my first full approach, Villi encouraged me to be accurate. Again, the landing flare was very slight, and on touchdown, Lorenzo took control, selected beta on the props and we smoothly decelerated with plenty of runway remaining. We exited left at the end, and Lorenzo cleaned the aircraft up as I got my last chance to handle the Avanti Evo while we taxied back toward the ramp. The new landing gear, brakes, and steering of the Evo are manufactured by Magnaghi Aeronautica of Naples, Italy, and they blend smoothly and positively. As we returned to our starting point alongside Villanova’s smart, modern terminal, we allowed the PT6s to cool for the required two minutes before securing the airplane.